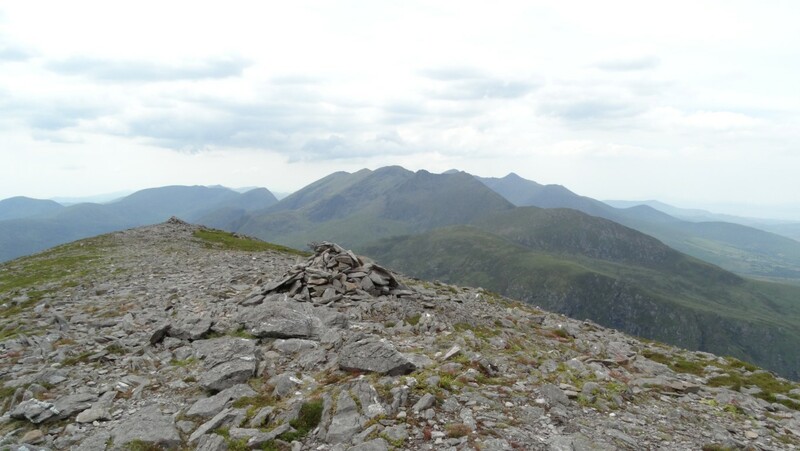 The high point of the day, the 832 metre summit of Purple Mountain with a view towards the Macgillycuddy’s Reeks – but where is everyone! 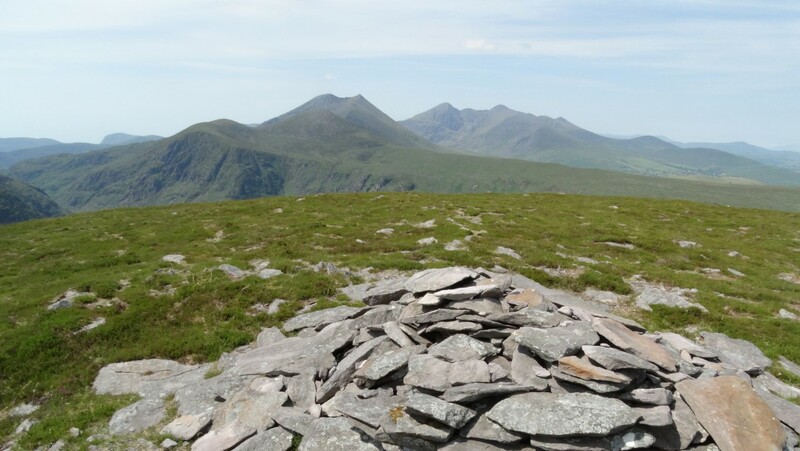 Ranking the 21st highest mountain in Ireland, the 832 metre Purple Mountain is very much overshadowed by its more famous neighbour, the Macgillcuddy’s Reeks but an excursion to bag this peak plus it’s satellites is a rewarding day out. 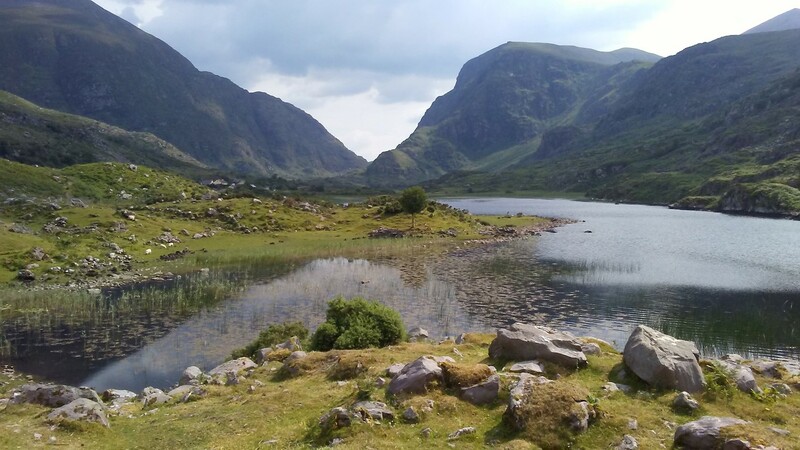 The mountain lies between Lough Leane and the deep gash known as The Gap of Dunloe. The mountain takes its name from the shivered slate found on its surface not that I had noticed any purple tinge. From my base in Glengariff it was a fairly lengthy drive to get to the start point for this walk and I half expected the car park at Kate Kearney’s Cottage to be full. It was a nice surprise to see it far from full on this summer Saturday morning and furthermore there was free parking at this popular beauty spot – now you don’t see that in English Lake District! So who was this Kate Kearney that we have all heard about? My research showed that she was a local beauty who illegally distilled a poitin which was so strong it took seven times the amount of water to make it palatable. Poitin can only be made from cereals, grain, whey, sugar beet, molasses and potatoes. This path is marked on the Harvey’s Map but I just wondered how far it went. Thankfully it went almost all the way up the mountain. 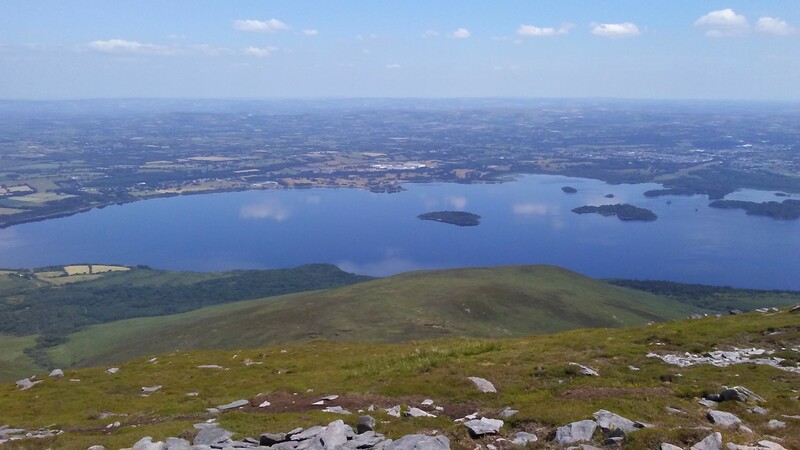 On Tomies Mountain and the view towards Lough Leane. White fluffy clouds are mirrored off the lake surface on this still day. It was 11am before I started out and I was pleased that I had done some research on how to gain access onto the mountain as there were houses and fields which bordered the eastern side of the road. With the help of my Harvey’s Map, a track ran east, a short distance north of Kate Kearney’s Cottage before turning south alongside a deer fence before abruptly stopping. Thankfully there was a reasonable path which carried on up the mountain side well beyond the point where it finished on the Harvey’s Map. 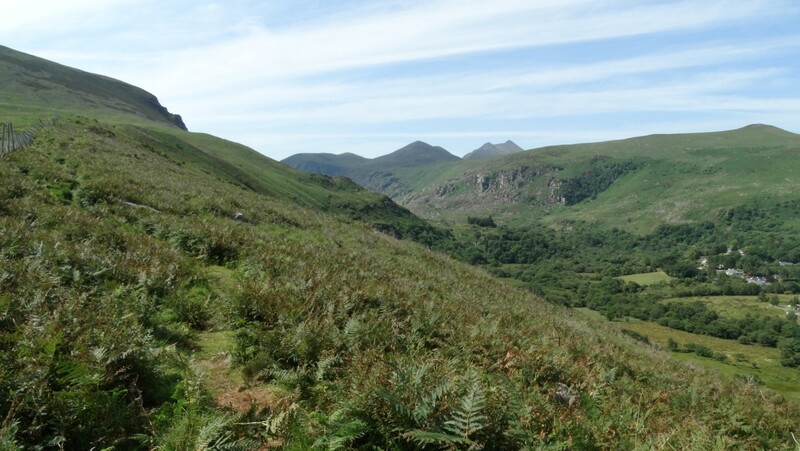 I made steady progress up over the first spur before tackling Tomies Mountain 735 metres. Nearing its summit, I veered left to skirt around the base of a scree area. On the summit I stopped for lunch and had the place to myself. Lough Leane below me was like a mirror and little white clouds reflected off its surface. My route from Tomies Mountain North towards Purple Mountain. Easy high level walking. Before heading for Purple Mountain I wanted to visit two satellite summits and first headed over the slightly higher Tomies South 757 metres before heading out and back eastwards to Shehy Mountain 762 metres. Passing Tomies South again I joined the ridge up to the top of Purple Mountain 832 metres. Being a Saturday, I was surprised to see no one around as I expected this to be a popular walk. By now it had clouded up and was turning out quite a dull afternoon but at least the cloud base was well above all the summits. 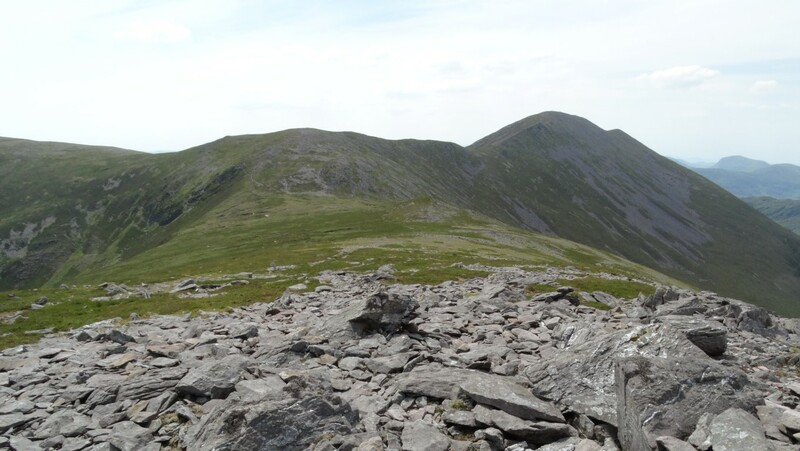 From the three cairns on the summit of Purple Mountain a stony path led southwest descending over a rocky lower summit then descending steeply down a steep rocky slope to the small Glas Lough. I was glad of the path beyond through this extremely rocky terrain and a further descent took me to the top of the Gap of Dunloe. 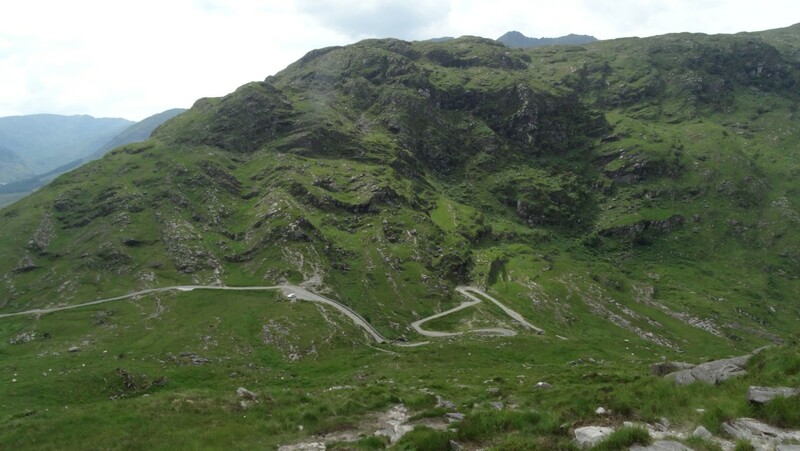 The steep way down towards the top of The Gap of Dunloe. Thankfully, I had a path to follow. The road walk back can be the less interesting part of the walk but not in this case. In many places the road squeezes between house size boulders with towering cliffs above on either side. I had always thought that the road through the gap was not open to the traffic and only used by jaunting cars but I noted that there were no restrictions to ordinary traffic. I paused at the top of this impressive pass before heading north on the long winding road which descended through quite spectacular scenery. Often, the road walk back can be a bit mundane but not on this occasion. There were towering cliffs either side with rock falls and house size boulders littering the steep hillsides. Several people were out walking the road and thankfully there was little traffic. I was passed by a few jaunting cars as I headed back to Kate Kearney’s Cottage and reached my car by late afternoon. The convenient Coffee Pot Cafe was still serving hot meals and so I finished up in there for my main meal of the day. 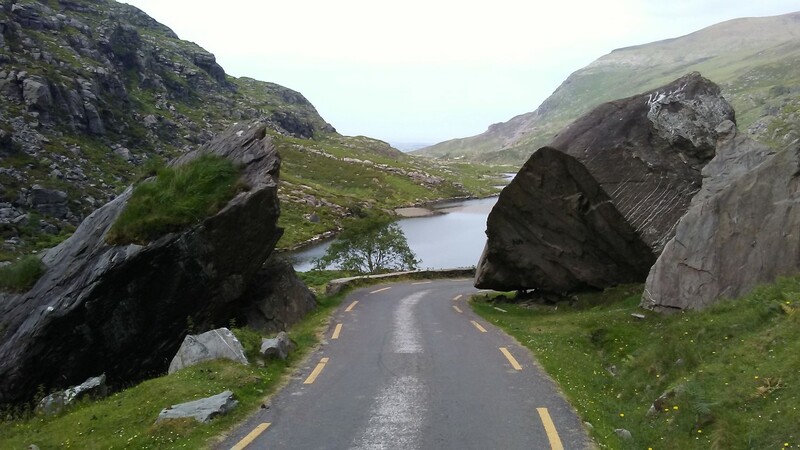 The view up through The Gap of Dunloe from Black Lake. I was now nearing the end of a fantastic walk.